JLL's Orange County blog offers expert insight on news and trends for owners, investors and tenant of commercial real estate. Learn more about our services and our professionals to see how they've helped clients with their commercial real estate needs. Click here to sign-up to get the latest commercial real estate insights and news from our Orange County team, delivered to your inbox. Categories: JLL, Office, Orange County, Research, Technology and tagged funding, JLL, office, Orange County, technology, venture capital. 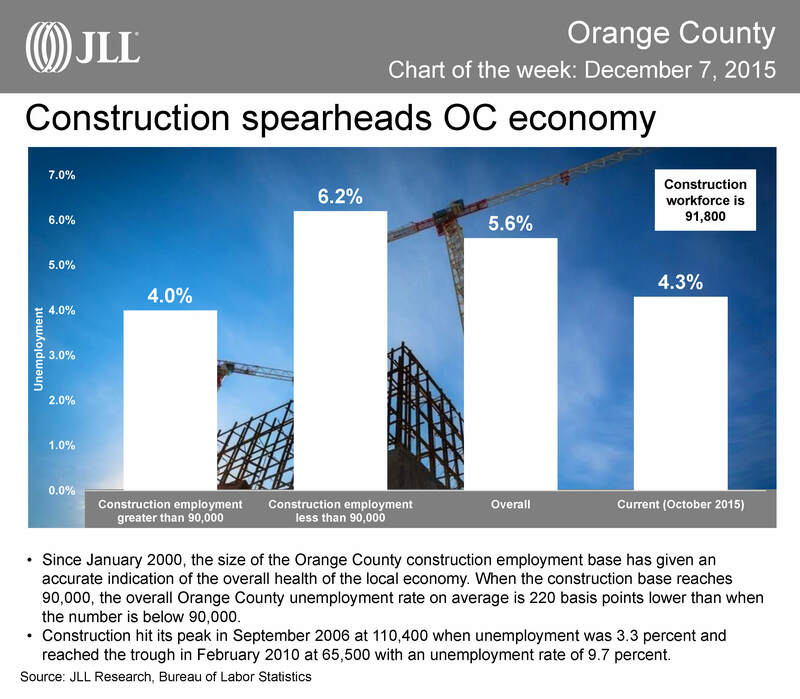 Categories: Chart of the week, JLL, Office, Orange County, Project and Development Services, Research and tagged chart of the week, construction, CRE, economy, employment, JLL, Orange County, research. Categories: JLL, Orange County, Project and Development Services and tagged construction, GlobeSt.com, JLL, Martin Potts, Martin Potts & Associates, project and development services, project management, Southern California. Categories: Orange County, Research and tagged economic overview, employment, JLL, Orange County. Population growth and median age: Which OC cities will be impacted the most? How much have OC office rents grown since 2010? Where are new O.C. residents coming from? Will Orange County law firms go creative? Will current construction satifsy increasing tenant demand? Does 'big-box' leasing sometimes create statistical anomalies? Will new construction save the real estate market shortage? Back-to-school shopping is protracted, sales are flat. An omen for the holiday season? Top U.S. Life Sciences clusters revealed: Did your city make the list? If money doesn’t grow on trees, then where is it coming from? Is the tech industry facing a labor shortage? JLL OC’s Louis Tomaselli featured in GlobeSt.com on Industrial's top trends in the U.S.
© 2019 JLL Orange County Blog | Commercial Real Estate. All Rights Reserved.